In the image displayed here, a crack that had formed when a crystal was broken slowly heals itself. Self-healing materials are nothing new but they belong to the polymer family. This crystal is made of dipyrazolethiuram disulfide and is more specifically a molecular crystal just like sucrose is. Now imagine you break apart a sugar cube and then press together the two resulting pieces. Will they ever reform to the original sugar cube? Not a chance. Yet somehow a dipyrazolethiuram disulfide crystal manages this as reported in Angewandte by Commins, Hara and Naumov (DOI). Their self-healing criterium: the re-attached pieces resist gravity and in quantitative terms the tensile strength is about 7% of the original. You may have never have heard of dipyrazolethiuram disulfide. In internet searches the compound shows up only in relation to this very publication. Unfortunatly as to the how this compound was selected the article is silent. The compounds apparently is easy to synthesise; pyrazole meets with carbon disulfide and potassium hydroxide to form Pyr-C(=S)-S-S-C(S=)-Pyr. According to the authors the self-healing originates from homolytic cleavage of the disulfide bonds to form radicals. The radical groups can then shuffle and reconnect across the crack. This requires some mobility and a bonus SEM experiment nicely shows how an indent made on de surface of the crystal slowly dissapears over the course of several days. A recent contribution from the Guosheng Liu laboratory concerns the asymmtric version of a copper catalysed alpha C-H-activation (Wen Zhang , Fei Wang DOI). This work builds on the classic Kharasch-Sosnovsky reaction. The substrates are benzylic compounds with unactivated protons at the alpha position, for example 1-ethylnaphthylene. The oxidant N-fluorobenzenesulfonylimide generates the achiral free radical . This cyanation proceeds with trimethylsilyl cyanide. The catalyst system is copper acetate and a custom-built bulky chiral bisoxazoline ligand. In the transition state copper has two cyano groups and is coordinated to both ligand nitrogen atoms with the remaining coordination site interacting with the alpha methylene group. Yield 91%, enantiomeric excess 96%. A recent contribution from the Kendall Houk laboratory concerns the asymmtric version of a palladium catalysed beta C-H-activation (Gang Chen et al. DOI). This work builds on work done by Giri et al. 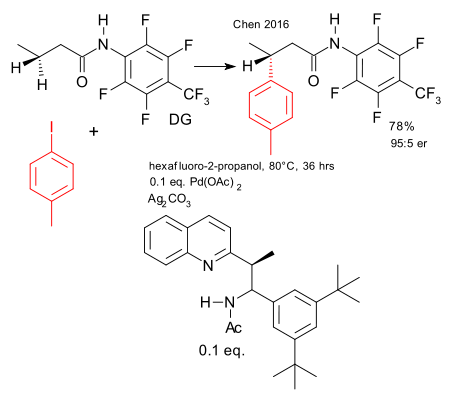 in 2005 on asymmetric Pd iodination (DOI). The substrates are amides with unactivated protons at the beta position. The large fluorinated aryl group acts as a directing group. 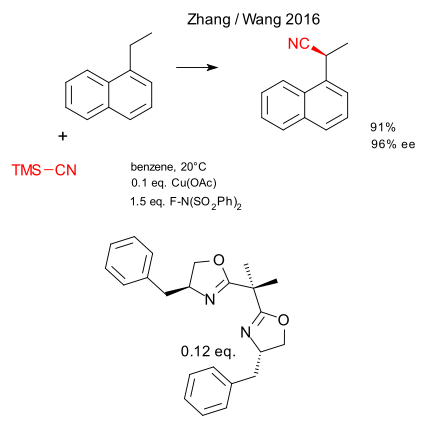 The catalyst system is palladium acetate and a custom-built bulky chiral aminoethyl quinoline ligand (isoquinoline plus N-Sulfinyl imine chemistry). In the transition state palladium is coordinated to all three nitrogen atoms with remaining coordination site interacting with the beta methylene group. Yield 78%, enantiomeric ratio 95:5. Hoffmann, Kabanov, Golov, and Proserpio have a thing to say about citations in a recent 15 page Angewandte essay (DOI) 1). The bottom line: do not be lazy citing work and with modern search capabilities there is no excuse really to not being able to find previous work. Here are some entertaining quotes: "crank papers are recognizable by their lack of citations, or by obsessive selfcitation". It may be interesting to note that Hoffmann limits his self-cites to 11 out of 137 citations. And coming from theoretical chemists: "Computational chemistry and physics at an intermediate level has always been easier than experiment." And this one: "it is wonderful to see an organic synthesis marked not only by a brilliant plan (or a brilliant salvage job once the initial plan went awry)". On search engines: "Google, Bing, Yahoo, Google Scholar, and other search engines are just incredible at unearthing information in the scientific literature, even as they visually crowd the webpage with commercial junk". Could not agree more. 1) R. Hoffmann, A. A. Kabanov, A. A. Golov, D. M. Proserpio, Angew. Chem. Int. Ed. 2016, 55, 10962.